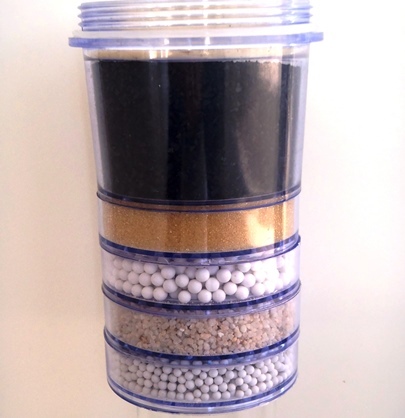 The 5 – Stage Filter Cartridge is the heart of the Annsation Water Filter. 5 layers of pure, high quality minerals will first remove impurities and then re-mineralise and alkalinise your water in a very unique way. It effectively removes bacteria, reduces flouride, eliminates bad odour and optimises the pH level. Fits also in similar Water Filter Systems available on the Australian Market. Removes chlorine, herbicides & pesticides, unpleasant tastes and odours and hundreds of other man-made chemicals. Purifies the water by removing toxins and heavy metals ions (e.g. lead, cadmium or mercury) and replacing them with more innocuous ions such as sodium and potassium. Create Alkalinity. Act as an antioxidant. Antioxidant-rich alkaline water promotes detoxification and increases oxygen and energy levels in the human body. Neutralises acidic elements to create an optimal pH balance. Benefits skin elasticity improves nail and hair growth and improves a healthy heart function. Reduces the aluminium accumulation in the human body and brain. Ionises and energises the water and helps to activate water molecules in human cells and blood. Used as stage 2-7. To be screwed in the middle ring of your Annsation Water Filter System. Replacement is recommended every 4-6 month depending on usage.